If you’re looking for ways to boost your writing instruction or to bring your colleagues along on your writing journey, we have several resources that can help. Read the first chapter from this book. 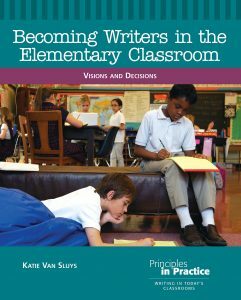 In this book from the Principles in Practice Imprint, Van Sluys demonstrates how to (re)claim our professional practice to ensure that young people have the opportunity to become competent, constantly growing writers who use writing to think, communicate, and pose as well as solve problems. Listen to author Katie Van Sluys talk about her book with imprint editor Cathy Fleischer. This essay describes an approach to teaching the braided essay, highlighting the rewards and difficulties. This article examines how a group of secondary English teachers conceptualized writing process pedagogy and digital tool use after a week-long professional development program. The author provides readers with resources to enrich writing instruction but also underscores the importance of being intentional about the choices we make for our students. The author argues that the tradition of the virtues has much to offer teachers and students and can clarify what it means, in an ethical sense, to be a “good writer” in a skeptical, postmodern moment. This article examines relationships in the writing process and offers some strategies to address student needs on both the cognitive and affective domains. This article provides concrete suggestions for teaching purpose, audience, context; invention strategies; text structures; genres; revision; and writer’s craft. The authors contend that by writing alongside students educators have the opportunity to serve as mentors for all stages of the writing process, especially during revision. In this article the authors present two tools teachers have been using to ensure their writing instruction is balanced, engaging, and authentic. In order to address the misconception that “good” writing equals errorfree writing, this article reports the need for students to create meaningful works of writing. The author describes instruction that was specifically designed to align with the concepts of code-meshing and constructivism. The five books reviewed call for care in understanding students and the many ways that they are positioned in the world and for more attention to reading pedagogy in conjunction with writing. This article identifies five categories of resources that preservice teachers drew on as they considered student writing and planned their own approaches to assessing and teaching writing. Lily Diamond, 2016 winner of the Donald H. Graves Award for Excellence in the Teaching of Writing, discusses ways in which she integrates issues of social justice during writer’s workshop. This column highlights examples of the values espoused by the Framework for Success in Postsecondary Writing and aims to increase understanding of this statement, advocating for its rich conception of writing. These classroom-tested lesson plans from ReadWriteThink provide ready resources for teachers working with students from kindergarten to high school. NCTE members and staff have published writing-related blog posts on a variety of subjects, from using NCTE and ReadWriteThink materials in the classroom to writing for civic action, and more. The National Day on Writing (October 20) was founded by NCTE on the premise that writing is critical to literacy but needs greater attention and celebration. The #WhyIWrite podcast features interviews with authors about their writing process, what inspires them, and the challenges they’ve faced. Places can be powerful catalysts for writing, inviting us to explore and understand our individual and collective relationships with one another and the world. Collectively, teachers have the power to leverage their voices and empower their students. They must continue to expand and enhance their skills by demanding professional development. In this article, four teachers of various levels of instruction share what makes the National Writing Project summer institute experience so valuable to them in their teaching lives and in the lives of their student writers. The authors explore the questions of whether and how ELA teachers can or even should add writing to their skill sets by following a teacher as she participates in a National Writing Project Advanced Summer Institute. This article explores questions about how to create meaningful PD experience related to the effective teaching of argumentative writing. In this column, we meet three early career educators who are finding strength and possibility in the teaching of writing through mentorship, reflection, and writing alongside their students. This article describes a state-level partnership with the goal of empowering teacher leaders to implement a professional learning project at their individual schools. This article describes an approach to professional development that capitalized on investments in expertise among English language arts teachers to support literacy across the district. Leaders have the opportunity to inspire, to motivate, and to make a positive difference in the lives of teachers and adolescents. This article focuses on international literacy leaders and their views of the teaching of writing. 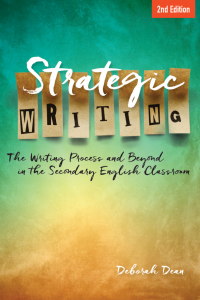 In this interactive session, teacher and author Debbie Dean will help participants enhance their writing instruction by considering process as a strategy and genre as an approach to teaching writing. Modeling is one of the most effective of all teaching strategies, and yet many teachers overlook this powerful tool in writing instruction. In this Web Seminar, Barry Lane focuses on tools to aid revision including growing leads from questions, digging for details using binoculars, and more.